This has come up in a few threads so I thought I'd start an official one. I think Alan Rickman or Hugh Fraser personally. Oh... not sure about Hugh Fraser. Terrence Hardiman would be my choice. demon headmaster yes?? he would be good. HOw about Dustin Hoffman. Small, thin, inocuous and smart at the same time.????? I think the best person who COULD have played Vetinari would have been Christopher Lee (pity he's dead) Ok, hes old, but it is commented on the he probably dyes his hair, and if you read the books right, Vetinari IS in his mid to late 50's in the present in Night Watch. So given that my choice is berift of life, joined the choir invisble and for all intents and purposes, an ex-thespian, this is a fairly pointless post. i think you may be mixing up your actors as Christopher Lee is still alive. Did you mean someone else? I was very upset for a moment there! Jeez, I'm sorry bout that, I was told he had died halfway through making Return of the King, I never thought to check up on it. Well I have now and he is most definatly still among us, so what do you think, Saruman as Vetinari??? Yep, he's still around, I read that and thought I must be getting it wrong, glad I wasn't ! Yer i think Chistopher Lee would be amazing as him. little hair dye needed of course. I don't know, Nighy can do nasty. He's a very good character actor. But I don't know if I can see him as a stealthy assassin. I can see it I think. Vetinari was a stealthy assassin when he was younger. He's not so young now. No - Bill Nighy may be many things, but a predatory flamingo he is not. And Christopher Walken is too... psycho-looking. Actually, having seen HP5 yesterday, I must say the idea of Alan Rickman as Vetinari is growing on me. Nighy, however much I love the actor, is not Vetinari. Strange, I have been wandering away from the idea. I think he is a great actor, but he fits my mental image of the character less and less. Still, of course, if he can play Snape, a character who, in the books, is more than twenty years younger than Rickman is now... Who knows. Still, of course, if he can play Snape, a character who, in the books, is more than twenty years younger than Rickman is now... Who knows. Anyone think Stephen Briggs looks a little Vetinari? He do any acting? Actually, I don't think I've ever seen a picture of Stephen Briggs. I find his face too pudgy and his eyes too sleepy, but otherwise not bad. Something about him reminds me of Rowan Atkinson though. It might be the pointy eyebrows. Stephen Briggs would like to play Vetinari in a movie and yes, he does act. He wrote the scripts for several books so that they can be done on the stage and he is involved in a theatre company. 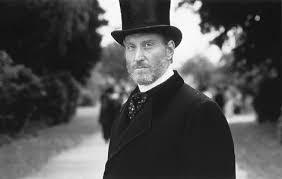 He portrays Vetinari at the Conventions and he did also at the town twinning at Wincanton in 2002. Pictures of Vetinari are very like Briggs but I'm not sure which came first. Apparently Briggs was upset a bit because he didn't get a part in Hogfather but then the Patrician wasn't in it. I think Rhys Ifans would make a very good Vetinari. He's tall, thin and can do twisted very well! howz about mr kidby as that is who the drawings of vetinari are based upon. you never know give him a few acting lessons and set him away he might even be half decent cant be any worse than joss akland as ridcully. Hm. Mr Kidby? That is who the drawings are by. Some of the Clarecraft figurines etc are based on Steen Briggs (sp?) I believe, but he again looks only vaguely like Paul Kidby's interpretation, exceot for fitting the universal description everybody can agree upon. Scroll down this site, and you can see what Mr Kidby looks like. so sorry iam a plum next time i'll try to remember articles ive read before quoting them feel free to lambast me to the rest of the site for being a dumbass! That would be Alan Rickman. Ooh,i like Rickman for it! After reading all of your choices I started thinking about actors I know who would fit the description. And I came up with Anthony Cistaro. Please Link To a Picture! dont you think jeremy Irons would be good as Vetinari? Possibly, though seeing who they got to play Rincewind and Twoflower for the new Sky version of Colour of Magic that's out at Easter, they could just pluck a name out of a hat and call him Vetinari. It seems to me like they haven't really taken any of TP'S visions (Take a look at The Last Hero) into account. And yet Pterry seems to be quite happy with those choices... I don't really get it, but hey, who are we to question the Marthter ? On another thread somewhere I heard someone mentioning Jason Isaacs for the Vetinari role. Never thought about him before, but having looked at a few pics of him and seeing some of the roles he's done (Lucius Malfoy for one) I think he is very well suited to play Vetinari! Have mentioned this on another thread, so I'll repeat myself and annoy you all. I think Alan Rickman would be great, yet I would like to suggest John Malkovich. Or am I deluded? Not Alan Rickman, I like him but he's too jowly. There was one perfect suggestion here: Jeremy Irons. He's got the low key humor and aloofness to make Vetinary come to life. What!? David Jason as Rincewind? But he's Albert/Alberto Malich.. I thought he did a great job as Albert. But No Way he could be rincewind. Too late. Although I thought Jeremy Irons would be perfect until I actually saw him and he put on that funny accent. Why ? I've been googling the movie, and I think I might like Sean Astin as twoflower, but David Jason just doesn't match up with my mental image of rincewind. He is too short and too well, not fat exactly but well-fed. Is there somewhere where I can get to see the movie? download or buy the dvd? The DVD isn't out yet, it probably will be by Christmas if Hogfather is anything to go by... I think you can see extracts and trailers on the official website. I actually liked Jeremy Irons as Vetinari. i think that he managed quite well to pass as merciless yet diplomatic and modern tyrant. I second Jason Isaacs...definitely didn't love Jeremy Irons. His portrayal of Vetinari was good, with his manner etc, but the accent bothered me as well. If we could have a 'Fantasy League' of any actors, my choice would have been Peter Vaughan who played 'Genial' Harry Grout in Porridge on BBC TV. Just the right mix of sinister with a hint of horrific humour. He's about 85 now but in his heyday he would have been an ideal choice. Hugh Laurie would be ideal. Tall, austere and witty beyond belief! Also, do you remember Jonathan Brett from the Sherlock Holmes series? He even got the temples exactly right. Although sadly dead. Amazing actor though. YES Hugh would be great! I find it a bit hard to picture real people playing the characters that are so familiar in my head as themselves though . Who are people thinking of for Sam Vimes? Is anyone thinking about him? Alan Rickman would be my choice! He is pale, well spoken, controlled, commanding, cool and looks great in black.